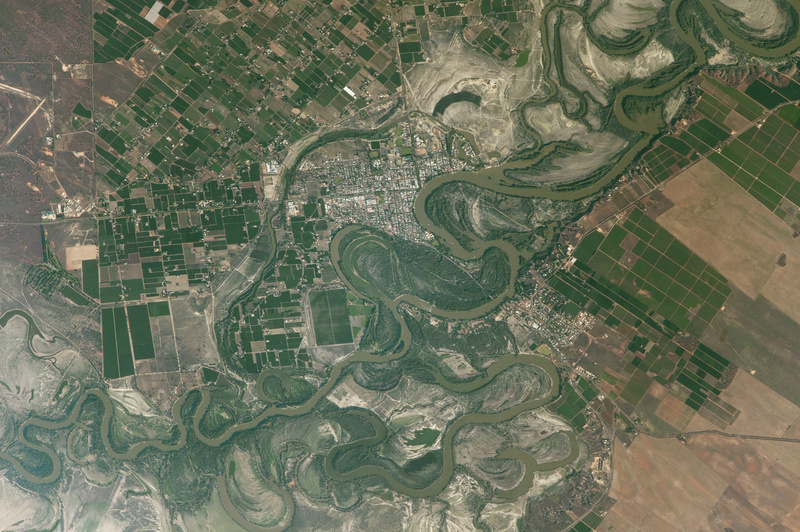 An astronaut aboard the International Space Station captured these photographs of agricultural patterns in the Riverland region of South Australia. The use of a powerful lens makes it possible to see individual buildings in the small towns, a bridge joining the towns, and one of the many locks on the river. Renmark is one of the major towns in a line of settlements along the Murray River. 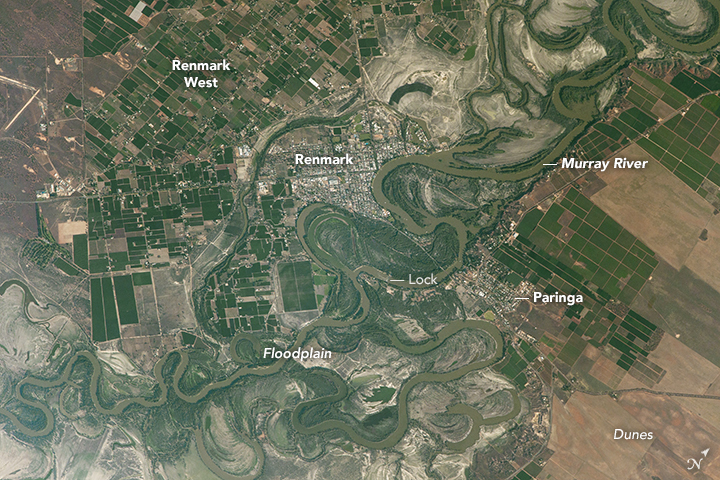 The image above shows the winding course of the Murray in a wide floodplain, with numerous small farm plots clustered along its banks. This heavily irrigated country is a mix of grapevines, almond groves, stone-fruit orchards (like peaches and apricots), and citrus orchards. More than half of South Australia’s famed wine production comes from this area. The intensely farmed landscape contrasts with the arid landscape in the second image, which shows an area just 20 kilometers (12 miles) south of Renmark. A large, dry lake is crossed by a winding road. Rounded, ancient dunes stand south of the settlement of Taldra. The dry lake has been the site of growth trials for a salt-tolerant giant cane crop, according to local agriculture officials. Surrounding the lake is sparser vegetation that allows the underlying linear dunes to remain visible from space. 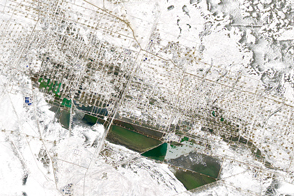 The surrounding fields show faint parallel lines that indicate a plowing pattern. These fields are part of a mixed farming agriculture in which crops (mainly wheat and barley) are grown for two years, after which the fields provide pasture for grazing livestock. Astronaut photographs ISS050-E-36713 and ISS050-E-36717 were acquired on January 27, 2017, with a Nikon D4 digital camera using an 1150 millimeter lens, and are provided by the ISS Crew Earth Observations Facility and the Earth Science and Remote Sensing Unit, Johnson Space Center. 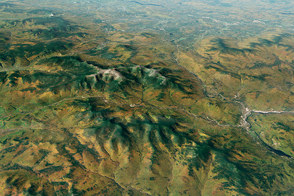 The images were taken by a member of the Expedition 50 crew. The images have been cropped and enhanced to improve contrast, and lens artifacts have been removed. The International Space Station Program supports the laboratory as part of the ISS National Lab to help astronauts take pictures of Earth that will be of the greatest value to scientists and the public, and to make those images freely available on the Internet. Additional images taken by astronauts and cosmonauts can be viewed at the NASA/JSC Gateway to Astronaut Photography of Earth. Caption by Justin Wilkinson, Texas State University, JETS Contract at NASA-JSC. 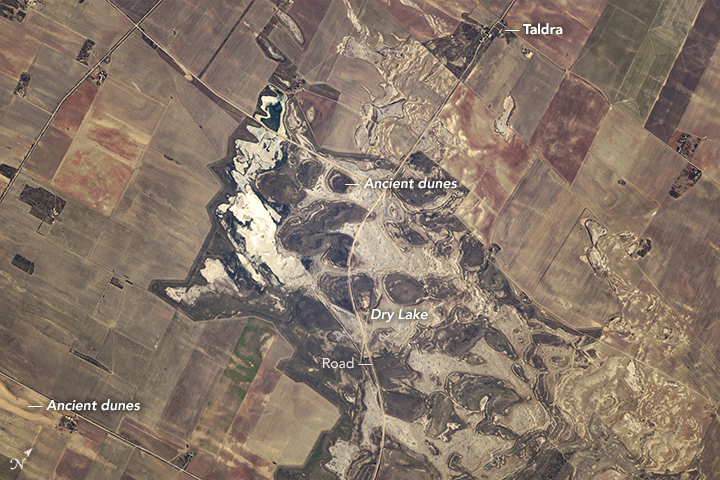 The landscape near the southern Murray River contrasts fertile farmland with dry lakes. 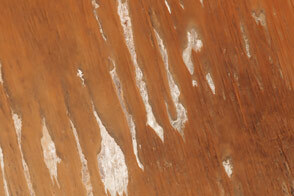 NASA Earth Observatory (2012, January 2) Menindee Lakes, New South Wales, Australia. 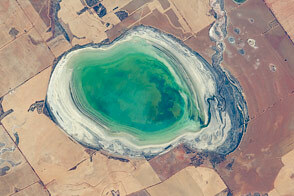 NASA Earth Observatory (2002, December 1) Lake Tandou, New South Wales, Australia. NASA Earth Observatory (2016, July 16) Boom-and-Bust Water Supplies in Southeast Australia.